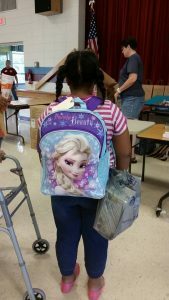 Fauquier FISH has provided book bags of school supplies to children in need for over 20 consecutive years now through the Book Bag School Supply (BBSS) program. Fauquier FISH, along with other residents, churches, and businesses sponsor and pack book bags of school supplies that are handed out each summer. There are no qualification requirements for this program. Parents in need simply call to register their children to receive a bag. Each year, the program grows. While this program is not food-focused, it does align with our desire to service children in our community, recognizing that having adequate school supplies allows children to start out the school year on a positive note. Our distribution for the 2018-2019 school year was held on Aug 11, 2018 and almost 800 backpacks with school supplies were distributed. Thank you to everyone who sponsored a child or donated school supplies to the program this year! Donations are accepted at 24 Pelham St. Warrenton, VA 20188. Donations are also accepted online.